Dosage & Administrations : I/M Use Only. Indications : Prevention and treatment of hypocalcaemia in cows and buffeloes. Particularly during pre and post parturition period. 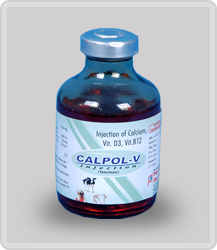 As a Tonic to maintain milk yield & to improved general health of animal in conditions of debility & weakness.